Also: The Outer Worlds, Artifact, Just Cause 4, our 2019 preview and more! Phoenix Point is X-Com creator Julian Gollop’s new tactical, alien-hunting romp. You can see it in action in the latest trailer, but for a proper in-depth look, you’ll want to read Andy Kelly’s exclusive preview and this month’s cover star. Expect tense fights with a roster of horrible alien monsters. Did you hear it was 2019? Yes, 2018 is an increasingly tiny dot in the rear view mirror, so it’s time to properly leap into the new year with our big 2019 preview. We’ve crammed the future into this issue with a good look at the great games coming out across the year. There’s a treat for your eyes, too, as Pip takes a look inside indie developers’ sketchbooks in The Art of Indie. We take a trip into space this month in our preview of Obsidian’s upcoming sci-fi RPG, The Outer Worlds, not to be confused Outer Wilds, also getting the preview treatment in this issue. They’re joined by Ape Out, Scavengers, Heaven’s Vault and more. Reviews this month include Valve’s Dota 2 CCG, Artifact, the tornado of destruction that is Just Cause 4, adorably weird Katamari Damacy Reroll, Mutant Year Zero: Road to Eden and plenty more. Elsewhere, you can brush up on your hardware jargon with our jargon busting guide and, once you’re done, read our hardware buyer’s guide. And you get two free gifts this month! You’ll be able to sail around the ominous, otherworldly unterzee in Failbetter Games’ Sunless Sea, and after that you can go blow up some tanks with a War Thunder bundle. 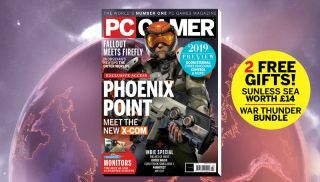 Andy checks out Phoenix Point in our cover feature. We look ahead to the next year of gaming in our 2019 preview. Pip shows off some gorgeous indie art. Learn more about Obsidian's The Outer Worlds. Outer Wilds, Ape Out, Scavengers, Heaven’s Vault and more previewed. Artifact, Just Cause 4, Katamari Damacy Reroll and more reviewed. Hardware jargon and buyer's guides.